Fidelity National Environmental Solutions, LLC (FNES) uses a patented advanced oxidation water treatment process called Ozonix®. The Ozonix® process employs a powerful, liquid chemical-free combination of sciences that provide very high rate treatment for Bacteria, Scale, Organics (oil, grease, volatiles) and Hydrogen Sulfide while producing a fluid that is more compatible with other chemicals being used in the completions process. Ozonix® treatment also reduces Chemical Oxygen Demand (COD) and Biological Oxygen Demand (BOD) by oxidizing hydrocarbon compounds. Tests have shown reductions of 400 mg/L of hydrocarbon compounds down to less than 40 mg/L with one pass. Hydrocarbons are generally oxidized into CO2 or H2O. The Ozonix® solution is scalable, modular and can be customized to fit a customers fluid treatment needs. The Ozonix® process involves the use of Hydrodynamic Cavitation, Ozone (O3), Acoustic Cavitation, and Electrochemical Oxidation/Precipitation. Mineralizes non-biodegradable organic matter and eliminates nitrogen species. The patented Ozonix® process utilizes the unique combination of these four treatment steps in one treatment process. The combination of cavitation and electrochemical oxidation drastically enhances the effects of ozone by creating secondary oxidants. Oxidants break the cell wall of the micro-organisms, making the Ozonix® process one of the best available biocides on the market. The cavitation steps not only aid in the production of secondary oxidants, such as hydroxyl radicals (OH-) but also aid in breaking bonds to allow more efficient mass transfer and improved oxidative treatment. Additionally, the cavitation aids in breaking down the particle size of solids in the fluid. Although the technology does not remove solids from water, the treatment eliminates the negative effects of those solids while eliminating the waste streams commonly generated from water treatment. The electrochemical precipitation process uses DC current to precipitate scaling compounds. By precipitating salts in the presence of an oxidation reactor, the compounds are neutral and will not form scale. This process can be tested and validated using physical scale deposition tests, such as the dynamic tube blocking test. By neutralizing or bonding the cations, the fluid then becomes more compatible with an anionic friction reducer. Therefore, the fluid does not require as much friction reducer chemicals in order to meet pressure pumping requirements. The combined operation of ozone and ultrasonic irradiation/hydrodynamic cavitation produce hydroxyl radicals (Hart and Henglein, 1986) and attack the contaminants present in the effluent increasing the process efficiency (Chand et al. 2007, He et al. 2007, Jyoti and Pandit, 2003). DC current is passed through the water in the Ozonix® reactor. The efficacy of electrochemical oxidation is enhanced when combined with ozonation by decomposing the residual ozone to hydroxyl radicals. 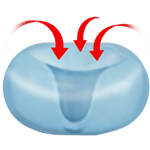 Cavitation eliminates mass transfer resistance. Chlorides aid this process by producing hypochlorite and hypobromite resulting in additional oxidants to sterilize the effluent stream. Electrochemical precipitation accelerates the precipitation of cations like calcium, barium, strontium and iron. 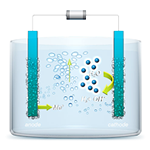 The oxidation reaction takes place at the anode, which is positively charged, and the reduction reaction takes place at the cathode, which is negatively charged. Divalent cations combine with CO2 and SO2 generated from the oxidation of organic material. The Ozonix® process has been tested, deployed, and commercialized in several shale plays (Marcellus, Haynesville, Woodford, Fayetteville, Eagle Ford, and Permian Basin), treating more than 50 million barrels of fluid in a four-year period for various customers. FNES’s Ozonix® process is proven to kill bacteria and inhibit scale “on the fly” in various types of completion fluids; to include flowback fluid and produced fluid, at very high rates. The oxidation of organics and heavy metals along with the precipitation of neutralized scale compounds results in a more compatible fluid for other frac chemicals and for the formation in which the fluid is being pumped. Operators can use FNES’s technology to increase the recycling rate of flowback and produced fluid and completely eliminate liquid biocides and scale inhibitors from the fracturing process. The combined effect of hydrodynamic cavitation, ozone, acoustic cavitation and electrochemical oxidation/precipitation mean that in addition to the direct attack by ozone, hydroxyl radicals (OH-) form in the system (Hart and Henglein, 1986). These hydroxyl radicals attack the contaminants present in the effluent, which increase the process efficiency and effectiveness (Chand et. Al. 2007, He et al. 2007, Jyoti and Pandit, 2003). The exact benefits of Ozonix® treatment is a function of the treatment rate and the level of constituents in the fluid. The treatment of organics, to include bacteria and hydrocarbons, is designed to provide adequate treatment at variable flow rates from 10-80 barrels per minute, in one treatment unit, of extremely challenging fluids. The treatment of scale is a function of total dissolved solids (TDS), with maximum designed capacity of 200,000 ppm TDS. Once successful treatment is demonstrated with water of a certain contaminate level at a certain rate, the Ozonix® treatment system will replicate that performance time and time again.